We began our look at Jacob last week, reading about his dream in Genesis 28. I hope you learned that the Stairway to Heaven existed long before Led Zeppelin came on the scene. But as I said, the dream itself served only to grab our attention. What’s important was the Lord speaking to Jacob and the promises made. As we explore other Jacob stories, we need to remember that these tales are humorous. In the centuries following, those telling the stories around the campfires or in the slave huts of Egypt, would have laughed at Jacob. Think about him tricking his brother out of his blessing using skins to confuse his blind father, causing the old man to think that it was hairy Esau and not the fair skinned Jacob. And then there’s old Laban, who we’ll meet today, tricking the trickster. As we saw last week, Jacob is on a journey, but other than the night of the dream, we’re not given any details. We’re not told of his sore feet, his aching body, the nasty camels or any of that. Instead, in the chapter after his dream, we find that Jacob has arrived in the land belonging to Laban, his mother’s brother. He’s there to find a wife. At the beginning of the chapter, he spots a well or cistern. There’s something about watering holes in the Old Testament that seem to bring couples together. At this well, there are some shepherds. Jacob asks them about Laban and they point to a woman tending sheep. “She’s Rachel,” they say, “Laban’s youngest daughter.” Jacob is smitten at first sight. This is who he’ll marry, he hopes. The shepherds have not yet opened the well, probably because there was an agreement that all those who drew from the well should be present when it is open. This is to keep everyone honest and not to allow someone to take more than their share of water. As Rachel approaches with her flock, Jacob ignores this tradition. Like a superhero, he jumps up and pushed off the heavy stone, a task that normally took several of the shepherds. His adrenaline is pumping. He wants to impress this girl. Jacob then kisses Rachel. As you can imagine, this doesn’t go over very well. We’re not told if he was slapped, but there’s a good probability of it. She then runs and tells her father. John Calvin found Jacob’s actions much too risqué and even suggested that maybe Moses got it wrong when he wrote it down! When Rachel tells her father who it was that kissed her, Laban doesn’t grab the shotgun, as we’d expect. Instead, he greets Jacob (whom he’s never met) like a long lost friend. He’s actually his nephew. This is where our reading begins. I’ll read Genesis 29:15-30, although we’ll be looking at the entire chapter (so keep your Bibles open). You can’t cheat an honest man? I’m not sure that’s true, but I do think Mordecai Jones is right in the fact that it’s easier to cheat someone who is looking to cheat you. Perhaps that’s why Laban was able to take advantage of his son-in-law, Jacob. As a young man, Jacob had found a way to cheat his brother, twice. He comes to Laban and is willing to work for his daughter’s hand. He toils for seven years. It doesn’t even seem like work, for he is so focused on Rachel, the love of his life. At the end of the time, there is a wonderful wedding. These events often went on for a week. When the night to consummate the marriage arrives, Laban, as the father-of-the-bride, surrounded by all the women at the party, leads the bride in a full veil to the wedding tent. It’s dark. There’s been plenty of drinking along with the feasting. Jacob is stuffed and a bit tipsy and doesn’t realize that the veiled woman isn’t his beloved Rachel. But he sobers up quickly the next morning when he wakes up and to find his arm around Leah, who’s lying next to him in bed. Adding to the humor are the names of the daughters. Rachel means ewe, and certainly Jacob loved her as if she was his “little lamb.” Although the meaning is debated, it’s probably that Leah is a variation of “cow,” certainly not a very flattering name. As our text reads, she had pretty eyes. And as you know, that’s often a backhanded compliment. Laban is probably correct in saying that the custom is to marry off the older daughter first. 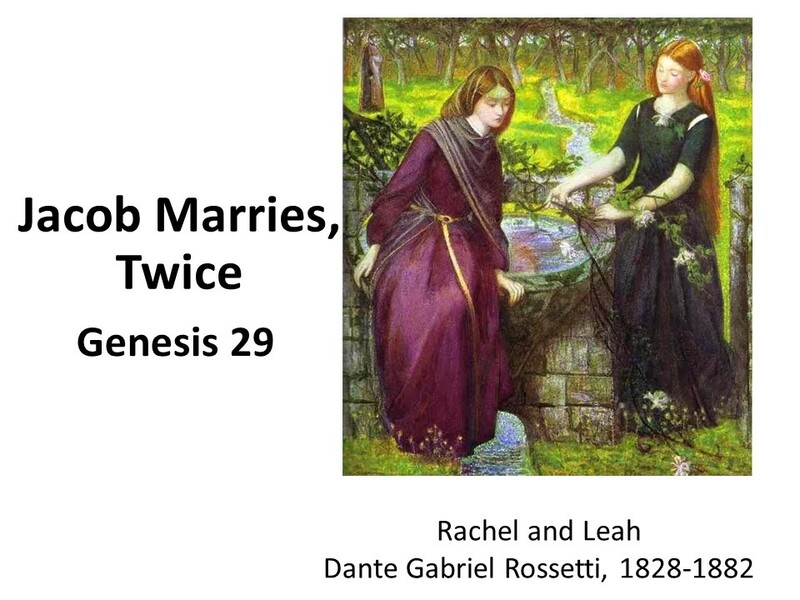 However, when Jacob asked for Rachel’s hand in marriage, Laban didn’t say no. In fact, he suggested it was better that she be married to someone distantly related than to a foreigner. Even though he’s had seven years to find Leah a husband, he waits and marries her off to an unsuspecting Jacob. Does he marry Leah to Jacob as a way to protect the honor of his oldest daughter? If so, it doesn’t really work for she’s now tied to a man who loves her sister. Does he pull this stunt off to obtain another seven years of labor from Jacob? Perhaps, but in doing so, he sows the seeds of discord within Jacob’s family. This deal with the two sisters and who is the oldest is ironic. Jacob had to deal with who was born first growing up. He and his brother Esau have had their fights. The two of them were twins, but Esau was born first. Therefore, Esau was set to inherit 2/3 of his father’s estate. Jacob would have inherited only a 1/3. But Jacob tricked his brother, selling him that expensive bowl of soup. And Jacob wasn’t satisfied there, he also tricked his brother out of the blessing. The blessing is more important. It had come down from God to Abraham and then Isaac. Jacob had tricked his brother out of his birthright, but now he’s tricked into having to work twice as long for the woman he loves. At the end of our passage, we see that Jacob is able to marry Rachel. But we also learn of the roots of jealously taking hold, for Jacob loved Rachel more than Leah. At this point, Leah is barren. She has not given birth to any children. In the verses that follow our reading, we learn that she cries to God and God answers her by giving her a boy. Interestingly, according to the text, God and not Jacob is responsible for the pregnancy. Yes, Jacob played a role, but God was the director of the scene. Lead names her son Rueben which means, “Look, a boy.” Leah, in this way, rubs her blessings into her sister Rachel’s wounds, for the younger and lovelier sister has yet to bear a child. In fact, it will be sometime before she will give birth. Before she is able to give birth to Joseph, the child that Jacob loves more than the others and compounds the family jealously issues, she tries what Sarah attempted to do with Abraham. She offers her husband her servant as a surrogate. Dysfunctional families are nothing new! This story is well-known and important in the history of Israel, but what does it teach us? It certainly isn’t an endorsement of polygamy, as some have said. If anything it shows the problems arising from competing loyalty. Nor does Scripture condone the treachery of Jacob and Laban, but it acknowledges it. We live in a fallen world, and often our actions demonstrate that sin is alive and well. Yet, even with sin rampart, God is listening to prayers. God is moved by the prayers of Leah, that she is given three boys in rapid succession: Reuben, Simon and Levi. And later, as we’ll see, God will hear the prayers of Rachel as she gives birth to Joseph, who will rise from his mistreatment by his brothers to save his people. God works in mysterious ways, and is at work through Jacob, so that by the time he goes back to the land of his father, he’ll have established a large family that will become the foundation of the twelve tribes of Israel. I suppose what we learn from these passage is that you only see God’s hand when looking backwards. Yes, there was plenty of sadness and jealous, but God was never far away, guiding things so that a nation could be formed and from that nation would come a Savior, God’s Son, Jesus Christ. Such insight should give us hope for the future. We might not always know why things happen, but we should still place our trust in God and enjoy life. For as I indicated at the beginning, these stories were told in a humorous way and laughter is always good. Know that God is present with his love and grace. God answers our prayers and is also able to laugh with our follies. Amen. Walter Brueggemann, Genesis: Interpretation (Atlanta, John Knox Press: 1982), 251. Frederick Buechner’s novel, Son of Laughter (San Francisco, HarperCollins, 1993) fills in many of these details. It is fiction. I have been reading this book as a way to get into the Jacob stories. Abraham’s servant found Isaac’s wife (Jacob’s mother) at a spring. Genesis 24:13-21. Gerhard Von Rad, Genesis, revised edition, (Philadelphia: Westminster, 1973), 288. The meaning of the word translated as “lovely” in the NRSV is disputed. Some suggest that instead of lovely, it means weak, which would mean that her eyes were not attractive to Middle Eastern men. See Von Rad, 291.